Midwest Real Estate Data (MRED) is the MLS of the Chicagoland. It encompasses Chicago and the surrounding region. It is among the largest MLSs in the nation. As you know, here at WAV Group, we love data and charts. Any ability to track trends in our industry that are supported by data lends credence to the strategic planning efforts across our industry. Lets take a close examination of this graph. The first thing that you notice is that mobile adoption is not a hockey stick. It was in 2011 and 2012 when adoption doubled from 7500 users to 15,000 users (62% growth for those who are counting). But it failed to grow to 30,000 users in 2013 (41% year over year growth). The numbers in the chart represent use by MRED Realtor® customers only. MRED has just recently begun tracking the client use of mobile when accessing data sent to them by their broker. If you were to add those numbers to the chart above you would see parallel growth amongst consumers – with volumes reaching an 8-fold increase in counts per device type. In the graph above, the purple tips are Windows 8 tablets. The green is Android. The red is the Apple iPad and the Blue is the iPhone. Within a reasonable range of variance, this graph would indicate that there is little market shift in the utilization of Android vs. Apple. This is notable because Android devices outsell Apple devices by a significant rate. You will also notice that Blackberry is officially in its grave, resting peacefully beside its fallen brother, Palm. What is remarkable here is the emergence of the Windows 8 Tablet. If you are in the technology business, you need to go out and purchase one of these devices immediately. I have been using the Microsoft Surface. It is an extraordinary device that marries the mobility of the iPad with the utility of a laptop. Moreover, it runs full desktop versions of your installed applications. That means full versions of Microsoft Word, PowerPoint, Excel, and Explorer. It also runs mobile apps, and it syncs with iCloud. All of my favorite iPad apps are available on the Surface – including Evernote, Flip, Skitch, Instagram, Facebook, Twitter, Skype, Bank of America, Netflix, Pandora, Hulu, ESPN, YouTube (plays all videos, even the ones that are not formatted for mobile), iTunes, Adobe, DocuSign, Find my Phone, Chrome, iCal, mail, QuickTime…..and of course the bell ringer…….solitaire! Like the iPad, it offers touch screen, but as a bonus…..there is a pen! If you long for the days of the pen that came with the Palm Treo, you will be back in the saddle. Over 90% of REALTORS® use laptops over desktops today. They bring their work with them. Since just about every Windows laptop from every manufacturer is incorporating touch screen, you will see widespread adoption of Windows 8 Tablets by industry professionals. This may accelerate as these tablets come with Internet connectivity to the 4G or LTE networks. Right now, you need to connect to a wireless network or pair it with your iPhone or Android phone. In three years, I would expect to see fewer iPads and more Windows Tablets. They are about the same price and the Windows Tablet replaces two devices – a tablet and a laptop. This practicality has the potential to kill the iPad. Android and Apple will not give up. These great companies (Google and Apple) have proven that they can react quickly to market demands and reinvent the future in a short period of time. Hence, this is why I choose to only look at a three-year forecast. Mobile moves so quickly because of the two-year contract. Everyone gets a new phone every two years whether they need one or not. Even that two-year spacing is being challenged by 1 year upgrade options. Frankly, I am surprised that the laptop industry has not implemented a similar upgrade pattern with the offer of 2 or 3 year leases. Even the MacBook, which once had a 5 year life, has been reduced to 2 or 3. They get slow like PCs, encouraging upgrades. 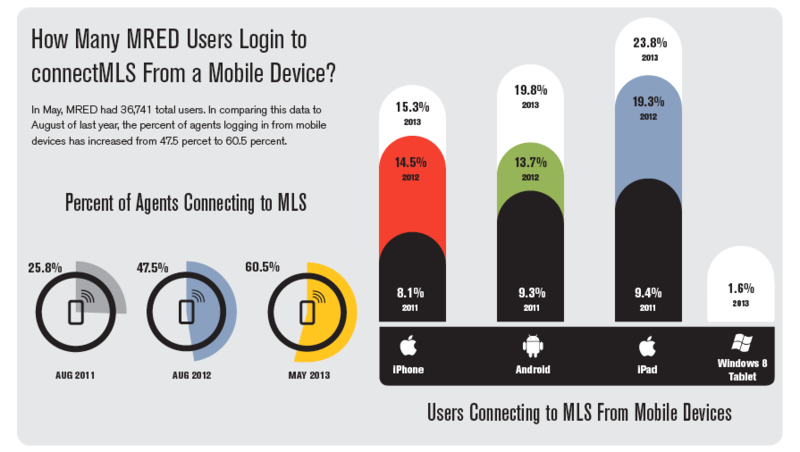 If you are an MLS and you are not watching patterns emerge with mobile adoption, you need to. With a few notable exceptions, the MLS system operates on mobile browsers and WAV Group believes that responsive design of web applications is the long-term viable strategy. Mobile apps are great toys, but they lack the industrial utility of the full application. MRED and their technology partner dynaConnections are moving forward with a complete responsive redesign of their workhorse connectMLS™ system. Based upon the consumer usage mentioned above, they will be focusing first on the real estate client side of the system – making the consumer happy makes the real estate broker happy. Study mobile usage and adoption of both the consumer and the REALTOR®. It may be unreasonable to test your MLS applications on every mobile device and operating system, but you should have a Windows Tablet, Android Tablet, and iPad for Quality Assurance. MRED’s award winning Help Desk maintains a complete stable of mobile products for both application testing and troubleshooting customer problems. Compatibility with all three of these operating systems is a requirement, not an option. Are you using connectMLS Wireless? The latest upgrade to connectMLS wireless includes better features for SmartPhones such as the iPhone, Android, and other phones with SmartPhone technology. However, if you do not have this technology but your phone is web-enabled you can still access the prior version of connectMLS Wireless, available at http://mredllcw.connectmls.com/wireless. For more info Click Here.